Patients' own Reports - New Recovered patient's reports continually being added. My name is Catherine Walter-Girout and I am 50 years old, I live to the full now as I am healed and made whole through our Almighty God. It all started in March 2001, when I had contacted numerous doctors to please tell me what was wrong with my body. Most of the answers I got at that time was that they said it was in my head.I then contacted dr. Nash Petrovic who immediately noticed that I had Chronic Fatigue Syndrome, and out of the 41 symtoms I had 90% of them. I was so affraid I could hardly brush my own hair, I could not even swollow my food down, and had lost a great deal of weight. The head pressure was severe and felt like I was in a bubble enclosed in pain. But after the first 3 months of taking 72 tablets a day my energy level started to lift. After 6 months of treatment my body was reversing the CFS and I felt like a human being again. It is now 6 years later and after a long journey I still take the maintenance packs every monday and am now doing a bit of exercise and work a full time job. 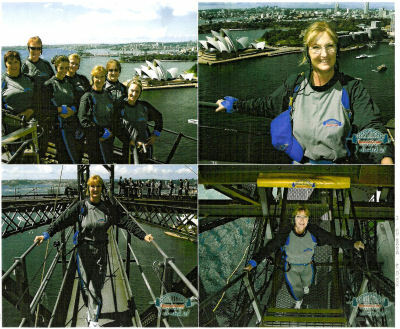 I just say thank-you to the Lord for using Dr. Petrovic as an instrument in my healing, this year I achieved climbing the Sydney Bridge in Australia, and di dit with flying colours, it is 503 metres long and 134 metres high. We also walkes miles around the city and managed wonderfully.